Comment On Ocean Heat Content “World Ocean Heat Content And Thermosteric Sea Level Change (0-2000), 1955-2010” By Levitus Et Al 2012 | Climate Science: Roger Pielke Sr.
We provide updated estimates of the change of heat content and the thermosteric component of sea level change of the 0-700 and 0-2000 m layers of the world ocean for 1955-2010. Our estimates are based on historical data not previously available, additional modern data, correcting for instrumental biases of bathythermograph data, and correcting or excluding some Argo float data. The heat content of the world ocean for the 0-2000 m layer increased by 24.0×1022 J corresponding to a rate of 0.39 Wm-2 (per unit area of the world ocean) and a volume mean warming of 0.09ºC. This warming rate corresponds to a rate of 0.27 Wm-2 per unit area of earth’s surface. 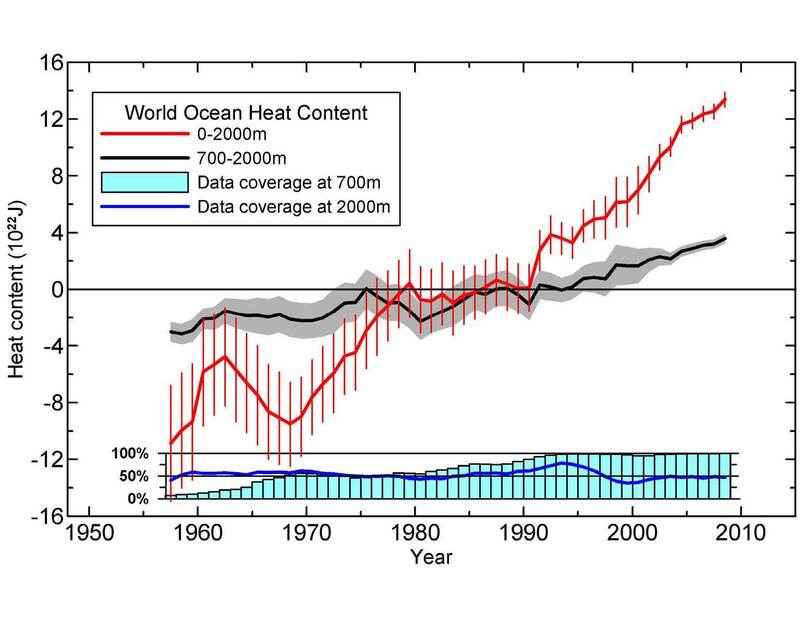 The heat content of the world ocean for the 0-700 m layer increased by 16.7×1022 J corresponding to a rate of 0.27 Wm-2 (per unit area of the world ocean) and a volume mean warming of 0.18ºC. 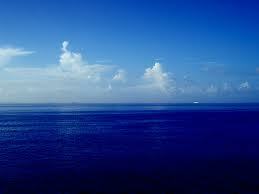 The world ocean accounts for approximately 90% of the warming of the earth system that has occurred since 1955. The thermosteric component of sea level trend is 0.54 mm yr-1 for the 0-2000 m layer and 0.41 mm yr-1 for the 0-700 m layer of the world ocean for 1955-2010. The third bullet they list is just a regurgitation of the IPCC claim that only increases in atmospheric GHGs can cause warming in the oceans. This is a model based claim and seems to be standard for the Levitus papers. Nonetheless, the observation part of his paper is quite informative. Second, in the Levitus et al figure, reproduced below, there is a more-or less monotonic increase of heat since about 1990. In the surface to 2000 meter depth, this accumulation of about 14 X 1022 Joules corresponds to a rate of heating of ~ 0.41 Watts per meter squared. As they also note in their paper, about 1/3 of this heating is at levels below 700m. There is, therefore, a question about their analysis of heating since the Argo network became dense enough to provide a more homogenous analysis of upper ocean temperatures in 2003. NOAA’s Pacific Marine Environmental Laboratory presents the analysis below which shows a muted warming in the upper 700m since 2003 as compared with the Levitus et al data. The Willis et al. 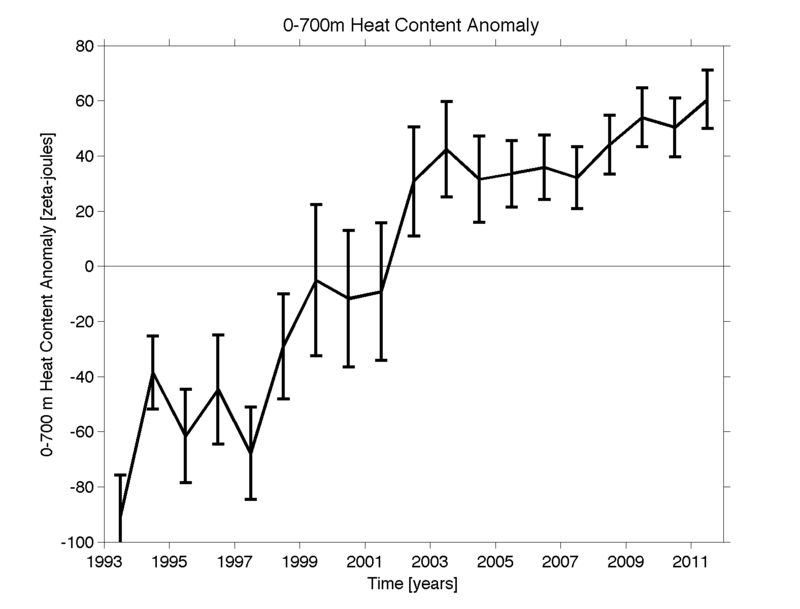 measured heat storage of 0.62 W/m2 refers to the decadal mean for the upper 750 m of the ocean. Our simulated 1993-2003 heat storage rate was 0.6 W/m2 in the upper 750 m of the ocean. The decadal mean planetary energy imbalance, 0.75 W/m2, includes heat storage in the deeper ocean and energy used to melt ice and warm the air and land. 0.85 W/m2 is the imbalance at the end of the decade [note added: he is referring to the 1990s]. Thus either using the 1955 to 2010 time period, or the shorter time period from 1990 to 2010 in the Levitus et al 2012 paper, the diagnosed magnitudes of ocean warming and global warming are significantly less than claimed by Jim Hansen in 2005. This discrepancy is even larger if we use the NOAA’s Pacific Marine Environmental Laboratory data.